When it comes to owning a home, proper maintenance of the different elements of the home is essential to ensuring that the home maintains its value and that it remains a safe environment in which to live. While it is hardly ever in view. The plumbing in a home is vital to the functionality and safety of the home. A ruptured pipe or backed up sewer line cannot only be costly, but it can be dangerous as well. When the time comes to repair or replace certain underground plumbing elements, homeowners should look to find the most cost effective and safe method possible. Currently, pipe bursting is one of the safest and most cost effective plumbing repair options available to homeowners. For homeowners who are unfamiliar with the pipe bursting method, it is the repair or replacement process in which a new pipe is literally pulled through the old one, simultaneously fracturing the old pipe and replacing it. This method usually requires minor digging to create an access hole on either side of the lateral. Following are five things that every homeowner should know about the pipe bursting method. Conventional methods for repairing underground pipes require an excessive amount of digging to gain access to the damaged area. This digging will damage landscaping and possible concrete areas like the driveway and sidewalk. Fortunately, the pipe bursting method only requires that a small access hole be dug in order to reach the pipe on either side of the lateral. Because there is less digging, there is less chance of causing any type of significant damage to the property. 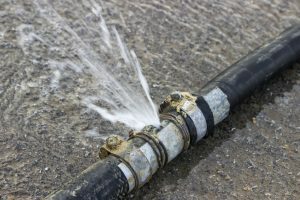 In addition to the reduction in property damage, and the subsequent repair and cleanup, the pipe bursting method is a more environmentally-friendly approach. In many communities, homeowners are held responsible for maintaining the sewer line that leads from their home to the sewer main. The maintenance of the sewer line can become a costly responsibility; however, using pipe bursting as repair or replacement method will increase the durability of the sewer line, with a life expectancy of beyond 50 years. The cost of repairs and replacement using traditional repair methods can end up be triple the cost of using the pipe bursting method. Due to the flexibility in the different ways that pipe bursting technology can be used to repair or replace underground piping, the extent to which this method can be used to repair damages is almost unlimited. Whether the piping is suffering from normal deterioration, corrosion or adverse performance, due to poor installation, the pipe bursting method allows the plumbing to be replaced partially, in the trouble areas. And this is done without the normal digging, and all of the dangers and costs associated with it. What many homeowners are unaware of is the fact that the digging associated with more traditional plumbing repair methods exposes them to certain harmful substances, including mold and asbestos. The longer that the ground remains excavated, the more the risk of exposure increases. The pipe bursting method almost completely eliminates the need for digging, subsequently reducing safety risks around the site. When repairing or replacing underground plumbing, one of the most prevalent concerns of homeowners is the durability of the repair. How long will it last? No one likes to have their yard dug up at any extent, so when it happens they want to know that it will not be happening again any time soon. The good news is that pipe bursting repairs have a life expectancy that will exceed 50 years. Because of the flexibility and durability factors associated with the pipe bursting method, homeowner can be confident that this method will provide the results they are looking for, at an affordable cost. How does Trenchless Pipe Bursting Replacement Work? Once in awhile, the pipes that direct wastes from our homes do inevitably become obsolete as the result of the continual exposure to the elements of wear and tear. Ordinarily, property and home owners are usually required to dig up trenches along the paths of the pipes. This process is very tedious, expensive, and inconveniencing to both the home owners and those who reside in the same neighborhoods. However, this ought not to be the case anymore. For the last 15 years, a revolutionary new technique of replacing the pipes has been in existence. This is called the trenchless pipe bursting replacement technique. Trenchless pipe bursting replacement is a technique used to replace underground pipes without necessarily digging up trenches along the pavements, streets, and backyards as is the case with the conventional techniques. It basically entails dragging a brand new pipe through a damaged one and at the same time fracturing the old pipe outwards. It is preferably used in case the lateral joints have collapsed or if the underground pipes have joints. The scope of the job simply means how large and how costly the job is to be as well as the specific areas within the landscape that are to be affected by the pipe replacement work. This step is very necessary as it helps in drafting a suitable budget and in also notifying in advance the persons who are most likely to be affected by the work. The second step entails preparing the work area for the task of pipe replacement. This is carried out by cordoning off the area and clearly marking it as, “Work In Progress” or “Out of Bounds.” The workmen thereafter put on the necessary protective attire such as aprons, overalls, facemasks, and gloves to protect them from debris while working. The needed tools-of-trade are then assembled. Typically, the following are the most common tools for the job: a pulling machine, a retaining device, a hydraulic power pack, pulling rods, and the expander head. Access holes are then to be dug on both sides of the lateral pipes. This creates an opening through which the new pipes and cables are eventually pulled along. The access holes should be exactly at the same spot where the current pipe to be replaced starts and ends for greater precision and convenience. The final step involves the actual insertion of the new pipes into the access holes and the subsequent dragging of those pipes through the old pipes. This friction causes the old pipes to fracture and peel away and in so doing, create a way for their replacement with the new ones. 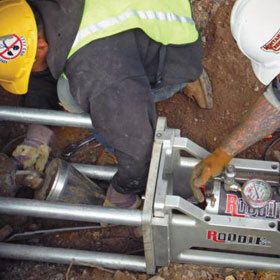 Trenchless pipe bursting replacement technique is estimated to cost around 30% to 50% more than the conventional digging techniques. On the flip side, it is time-saving in the sense that it carries out the task of replacing old, broken and worn-out pipes as quickly as possible and with very minimal effort. It is also convenient since it leads to less interference with the residents of the neighborhood wherein it is adopted. This stems from the fact that it does not at all interfere with or alter the landscape wherein it is carried out besides requiring no restorative work at the conclusion of a pipe bursting replacement. This technique is therefore more superior to the traditional pipe replacement methods and is therefore the way to go for home owners and tenants alike, the aforementioned minor shortcoming, notwithstanding! https://thepipeshark.com/wp-content/uploads/2017/11/logo-thepipeshark-300x67.png 0 0 PSAdmin https://thepipeshark.com/wp-content/uploads/2017/11/logo-thepipeshark-300x67.png PSAdmin2016-04-22 22:25:432016-04-22 22:25:43How does Trenchless Pipe Bursting Replacement Work? A number of factors can cause a pipe to burst, but the main cause is usually freezing temperatures. When the temperature drops below 20 degrees Fahrenheit, water pipes without insulation can freeze and break. A pipe bursting occurs when the water inside freezes and becomes ice, causing it to expand. This puts a lot of pressure on the interior of the pipe. Generally, the soft copper parts of the pipe are the first to give in to the pressure and break. The pipes that are most likely to freeze are those located near an outside wall. A properly working heating system that spreads the flow of air evenly throughout your home will prevent these specific areas of your home from becoming cold. Prevent your home from reaching temperatures lower than 32 degrees Fahrenheit. Direct warm air to all colder areas of your house. If your kitchen sink is located near an outside wall, make sure to keep the cabinet doors open to let warm air reach the pipes. Be sure to check the pipes in your basement. Heat tape can be used to warm pipes as needed. In an emergency or if it is dangerously cold outside, keep at least one faucet running slowly to allow warm water to move through the system at all times. Disconnect the hose from the outside faucet so that water is able to drain out of the hose bib instead of freezing inside. Water damage and freezing make up nearly 22% of homeowners insurance claims. It is extremely important that you have your pipes regularly checked for cracks that could lead to devastating bursts when the ice melts. Even if your home is new, it may be connected to older pipes that weaken over time, and pipe replacement may be necessary. Water pressure is the other common cause of pipe bursting. A plugged toilet or clogged water pump will cause the plumbing system to build up pressure. When the pressure is too much for the pipes to handle they will expand and burst. Pipe and sewer inspection should be conducted by an experienced professional only. Only a professional will be able to see the subtlest warning signs of an imminent pipe burst. Our team loves solving your tricky piping problems. The first step is we listen to what you’re saying. The three trenchless technologies each have their own strengths and needs. All of them will work, but only one will meet your needs the best. So clearly understanding what your concerns are is the starting point. After that we bring good equipment, best practices, and experience to your job. We work quickly and cleanly! Our trenchless sewer repair techniques reduce the need to trench up all of your yard or floor and other things in the way, like walkways, trees, roadways, etc. We guarantee the quality of the job, and stand 100% behind our work. Our trenchless or no-dig specialties include all three of the no0dig technologies; pipe bursting, pipe lining and pipe boring. We can even combine our trenchless equipment to bore a hole on a specific grade and then expand that hole and pull a new pipe into place where there was none before. Simply put, we can solve your underground piping without all the disturbance of traditional excavation. If you have a broken sewer or drain line, if your water line is leaking, if you have a cracked soil pipe buried in a wall, or if you need a new pipe installed and digging is difficult, Pipeshark can solve the problem with less disturbance to your grounds, your hardscaping, your infrastructure, and your routines. We can work on all kinds of piping including, terra cotta, clay, cast iron, concrete, orangeburg, copper, galvanize, ductile, steel, and all types of plastic or PVC. If you are in need of piping solution specialist, our family has been solving plumbing and piping issues for over 100 years. Now we’d like to take care of your piping needs. When a plumber or contractor is replacing a broken sewer line runs under a porch or tree or such, he’ll sometimes have us just do the pipe bursting part of the job. He’ll do the rest. It can be very efficient for all involved. When we are going to do a pipe bursting job with a contractor we’ve never worked with before, we try to help him understand that just about everything is going to be different. Even when we succeed in getting the main points across, the full value of pipe bursting is hard to realize until you’ve been through a whole job and managed it well. Pipe bursting is considered a trenchless or no-dig technology, but there is still excavation. It is more less-trench than it is trenchless. It is key to the final result how you manage that excavation. Even if the contractor is happy with the result, we are not if the result is less than it could have been. Pipe bursting is not just another way to replace a broken sewer line. It is a completely different way to run an drain replacement job. If you want to reap the full benefits of the technology, almost everything about your approach to install a new sewer line is different. When you do traditional excavation, whatever your plans are from the start, it is easy to accommodate unexpected issues which may arise. Let’s say you are going to replace a 150’ sewer lateral. Maybe you plan to get an early start and get it all excavated and the new drain pipe installed in one day. If you’re stuck in traffic, your equipment won’t start right away, you run short on material, or whatever, you just keep digging until it’s time to stop for the day. So instead of replacing all 150’ of the old clay or cast iron sewer pipe, maybe you just get just 100’ of new drain pipe in instead. You can easily make adjustments at any time. Pipe bursting is not like that. The plan is not easily adjusted. When you start, it is all in or all failure. So the plan is not just a suggestion. It is well thought out, well executed, and must be adhered to. If you have an 8 hour window to work in and it takes 8 hours to fuse pipe, prepare the holes and pipe burst the line, if you’re stuck in traffic, equipment won’t start, or you’re delayed for any reason, you’re not going to get it in anything. Traditionally, it’s the excavation that is the limiting factor on a new sewer line installation. So if you’re a plumber replacing the old clay, terra cotta, orangeburg, cast iron, or whatever drain pipe, you probably wanted someone to dig fast and give you plenty of room to work in. That meant the bigger the excavator the better and big trenches with big piles of dirt running along them. The client just had to understand that a mess comes with replacing his sewer lateral. With pipe bursting we know exactly the size of the holes we need before we start. That means we can now manage what was unmanageable before. With limited and precise excavation we can manage the excavated dirt with plywood set on drop cloths. We don’t have to move the excavator a lot so we can work off of boards to protect the landscape from damage. A smaller excavation means we can crib our equipment off of the sides easier and with less cribbing and so keep the bursting head better aligned in the center of the pipe. With a small hole, it is also easier to manage any groundwater which might be there with a smaller pump and less mud. Finally, a smaller hole is quicker to backfill and clean up around. On this recent job the plumber was going to replace his client’s broken cast iron sewer line from the curb to the basement. The line went under the front porch. We gave the plumber a photo of his client’s front yard with a diagram of the 4’ x 3’ pit we wanted to mount our equipment in by the curb. Inside he was to open up a 1.5’ x 3’ pit for the new pipe to enter. Unfortunately, his job foreman never got that information and so he did not know what to expect. When we arrived we found a full size backhoe on the job had dug a 2’ wide trench from the curb back 20’ up the lawn. The trench was full of groundwater, the pump had quit, and all was one big muddy mess. The basement work had yet to be started. We quickly saw that for the best stability we would need to move our pipe bursting equipment inside. We broke up the floor and dug the basement equipment pit ourselves. We asked the foreman to have his excavator backfill most of the lawn so there would be soil on the old cast iron drain piping to give it the needed stability during the pipe bursting. However, his excavator, who also didn’t understand pipe bursting, convinced him that backfilling before the new sewer piping was in place was pure heresy and wouldn’t do it. With a lot more work on our part, which wasn’t part of the deal, we pulled the new HDPE sewer line into place. But the yard was all ripped up and the plumbers were working in mud to make the final connections. There were muddy footprints all around the trench. We tried to explain to the foreman what should have been. But of course, he was a good guy who always pushed through and he was busy doing that now. Besides they didn’t know better and were content that the new piping was now run under the porch. They thought that was what pipe bursting was all about – change out the part of the sewer lateral that they couldn’t reach by digging. For us though, it was sad to see all that work when you know what could have been, and at less labor too. Pipe bursting is not easy. It is hard work with heavy equipment, cable, and cribbing which needs to be moved around. There’s little time to squander. That’s all the more reason to think and plan before you “make tracks”. In carpentry the expression is to measure twice, cut once. In pipe bursting you need to plan twice, work once. If you have a good plan there’s still plenty to be done. You don’t have to make more work for yourself, only to end up with poorer aesthetic results. It is not just a version of traditional excavation. It is a completely different trade. Once you understand how it all works, then you’ll grasp what the technology allows you to manage that you couldn’t manage before – and then you have to do that with a real discipline. Think twice, work once. If you’re reading this, you believe you need a sewer, water, or storm drain repaired, replaced or installed. Now you want to know the benefits of doing it “trenchlessly” versus traditional excavation. The answer depends on things like how much work is required to excavate it, how important are the things an excavator has to dig through, and the length and depth of the piping to be installed or replaced. Basically it takes the same amount of time to excavate each foot of trench. So as the trench gets longer, the cost goes up proportionally. Makes sense right, because there are no short cuts. The excavator has to remove the dirt (and whatever is in it or over it), set it aside, install the pipe, and then put the dirt back – for every inch of wherever the pipe has to go. If you want to replace or repair an existing pipe trenchlessly you have two choices. You can pipe burst it or you can line it. We do both. There are situations where one works better than the other and they have different costs because they are not the same at all. Pipe bursting is kind of a poor name because it implies more “violence” that it is. But the original invention was designed to work on piping which would fracture such as cast iron and clay. Modifications have since been made to work with a range of materials and others have tried to make the process sound friendlier by calling it pipe slitting or pipe cracking, but it’s all the same. It basically works by using some powerful equipment to pull a steel cable though the existing line and on the other end of that cable attach a bullet shaped head of some sort. That bursting head is designed to break or split the existing pipe open enough to allow room for a new piping to be pulled in right behind the bullet and in to the original place of the old pipe. The pipe that is installed is usually copper for water lines or high density polyethylene (HDPE) for sewer and drain lines. (See notes about HDPE pipe below.) So the two important differnces when weighing the pipe bursting option versus the pipe lining option is that you end up with a totally brand new pipe and you need access to each end of the old pipe to do it. The cost of getting to both ends of the old pipe is the same whether the pipe to be replaced is 20 feet or 400 feet long. Thus, unlike excavation, the cost per extra foot of piping to be replaced is proportionally smaller the longer the old pipe is. How the pipe bursting works? https://thepipeshark.com/wp-content/uploads/2017/11/logo-thepipeshark-300x67.png 0 0 PSAdmin https://thepipeshark.com/wp-content/uploads/2017/11/logo-thepipeshark-300x67.png PSAdmin2011-11-08 12:00:312011-11-08 12:00:31What is Pipe Bursting?